Open up your kitchen space with a bright look and open concept modern design backsplash tile. Create a beautiful accent wall with the horizontal movement of this modern white glass backsplash tile, perfect for pairing with open shelves that display simple bric-a-brac, beautiful dishes, or fun pops of natural color. Modern design backsplash tile works well when highlighting the simple natural beauty of the materials available, and the sparkling modern white glass backsplash tile will give you an elegant and contemporary look that will captivate you. Naturally resistant to heat and staining, you’ll never regret choosing this white backsplash tile for a simple and practical backsplash in your contemporary design. Frameless walnut cabinets in a medium brown or deep espresso stain wonderfully complement the white glass backsplash tiles. Keep hardware and other elements to a minimum for a clean space that keeps everything straight and even. European style cabinets that fit flush to the wall not only make your space feel more open but they also provide plenty of additional storage. An entire wall becomes a large pantry, perfect for additional storage and ridding your kitchen of clutter. Stainless steel appliances will finish off a modern design with clean elegance. Metal accents throughout the kitchen in the form of lighting and appliances will make your space feel clean, sleek, and effortlessly modern. Note how the appliances in this kitchen fit flush with the cabinets, making everything appear seamless and neat, a great feature in modern kitchens that also makes it easy to clean and allows you to create visual interest in other areas with the modern artwork and golden decor featured on this accent wall. Also, browse our white kitchen backsplash ideas. Simple countertops like a white & gray marble countertop give you the best that nature has to offer. The veining of the countertop and grain of the walnut cabinetry gives you a fresh and contemporary feel to your kitchen without making it feel cold or sterile. The sleek modern white glass backsplash tile or interior accent wall will maximize the clean and simple feeling in your kitchen without sacrificing beauty. They add beautifully bright, reflective surfaces to any modern space and highlight the natural beauty of the marble countertops. 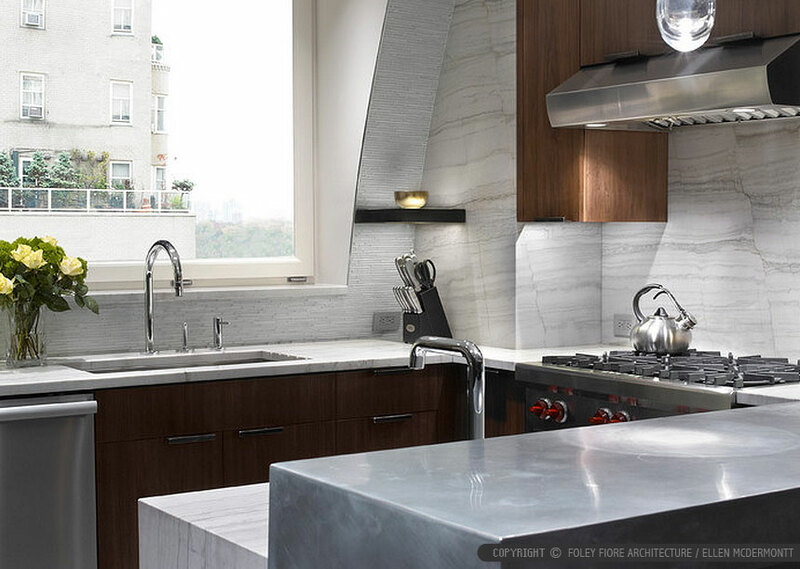 Also, modern subway marble backsplash tile can be used for modern design kitchens. Provide attractive lighting with dazzling pendant fixtures in a variety of modern metals to incorporate a chic industrial vibe to a modern space. Bright silvers or brushed nickels will look amazing against brown cabinetry and the polished white backsplash. Because of the combination of glossy and matte finishes in this mosaic tile pattern, it will reflect the light beautifully without overwhelming the eye. 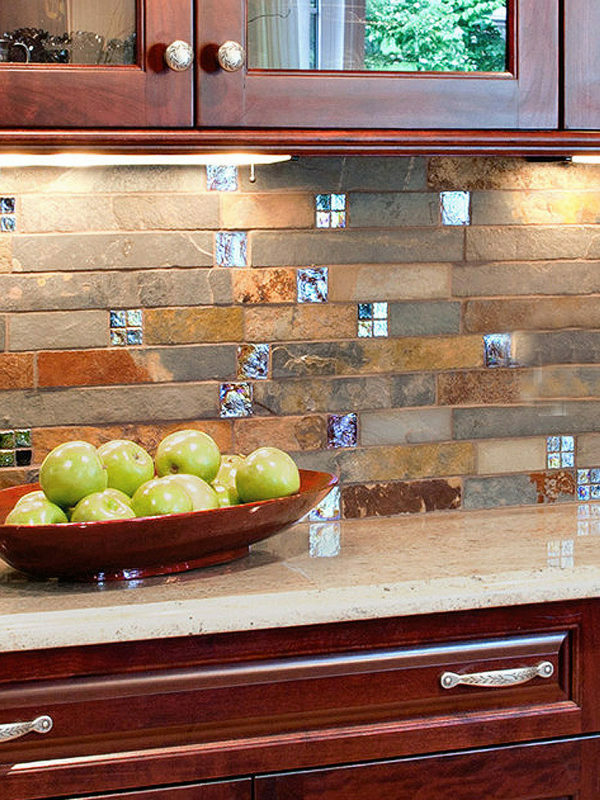 Make sure to provide plenty of light to allow your backsplash to shine the way it was intended. Let your design dreams come true with a simple design that favors neat spaces that feel open and fresh. Keep your space feeling clean yet cozy with warmer elements like the walnut cabinets and fun accents of color from plants, artwork, or fruit bowls. Like a home straight from your imagination, a modern kitchen complete with the elegant modern white glass backsplash mosaic tile will brighten your home with simplicity and refined elegance. This entry was posted in GLOSSY, MODERN, MOSAIC, Uncategorized, WHITE. Bookmark the permalink.